Space flight is the fulfillment of mankind’s deepest aspirations and impulses. While an inveterate traveler like myself is proud of the wanderlust that pushes me to circle the globe, I’m in awe of those courageous individuals who slip the surly bonds of Earth and voyage to the outer limits of the distances that technology permits us to traverse. Just the fact that astronauts can put up with g-forces and weightlessness is impressive to me; I would never survive a single session in the “Vomit Comet” that astronauts are taken up in as part of their training, and even a ferry ride in choppy seas makes me queasy. And over a half-century after Yuri Gagarin etched his name into the history books, space travel remains a dangerous proposition (just as ocean crossings on this planet once were). I salute the men and women who place their lives on the line in service of the advancement of science — and of helping to push the human race forward. 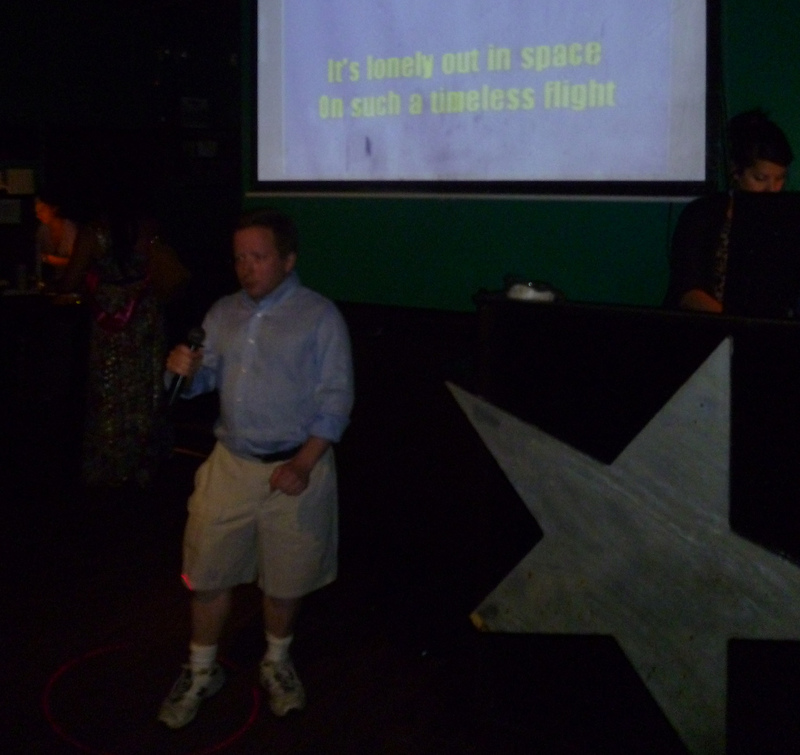 On a Saturday afternoon in August 2012, I paid homage to the American space program, and some of the hardy individuals who’ve populated it, by visiting the original Space Shuttle. Given the outsized valor of the astronauts who participated in the Shuttle missions, the Space Shuttle Enterprise is now on display, appropriately enough, at a museum that bears the name “Intrepid.” The full title of that museum is the Intrepid Sea, Air & Space Museum; it’s situated aboard the U.S.S. 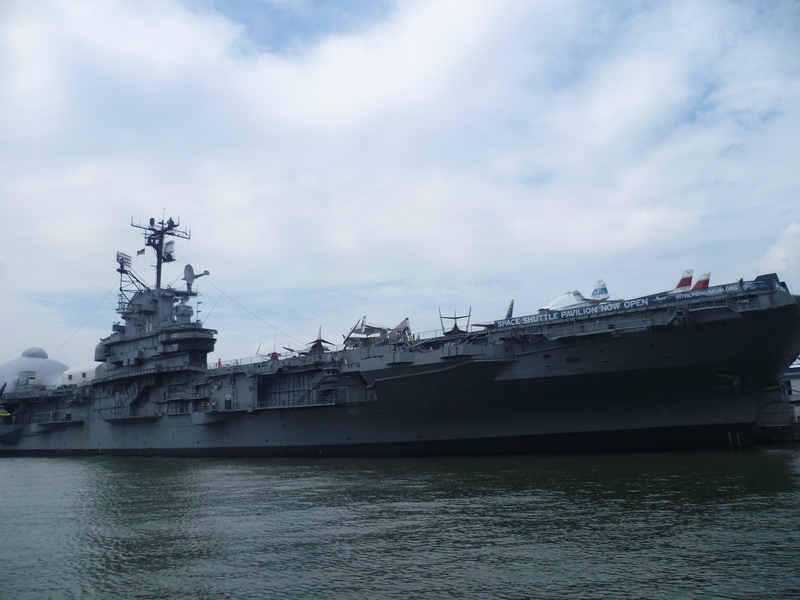 Intrepid, an actual aircraft carrier that saw action in World War II, and which is now permanently docked on the Hudson River at Pier 86 in Manhattan (see photo at left; as with most photos on this website, you can enlarge it by clicking on it). The Enterprise is housed inside a bubble-like pavilion at the rear of the ship (visible on the left side of this photo). 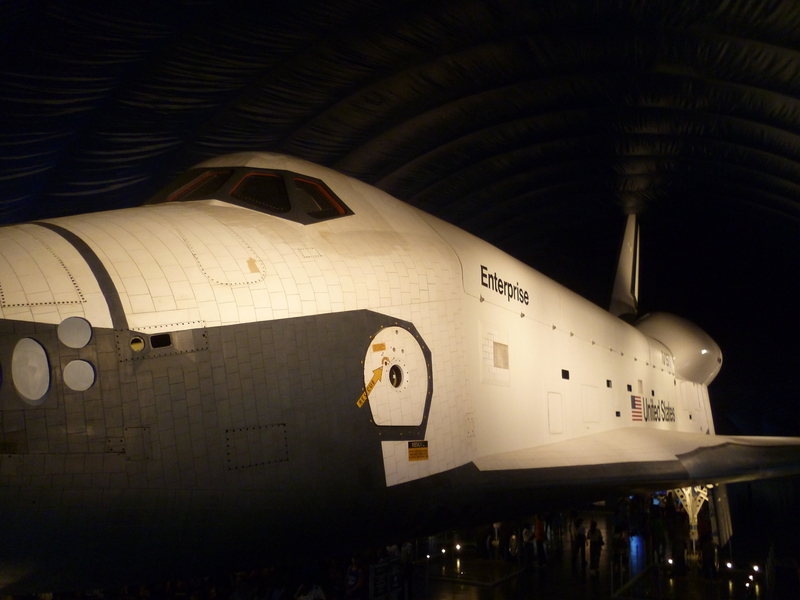 Unveiled in 1976, the Enterprise was the prototype for the Space Shuttle program, and as such, it didn’t fly on any orbital missions and never actually went into space; but it underwent important testing that benefited the 135 shuttle missions that took place between 1981 and 2011. This vessel was initially to be named the Constitution; but a passionate letter-writing campaign by Trekkies to then-President Gerald Ford resulted in its redesignation as the Enterprise. The Discovery is now on display at the Steven F. Udvar-Hazy Center, a branch of the Smithsonian National Air and Space Museum that’s located near Dulles International Airport in northern Virginia. In October 2012, the Endeavour was unveiled at its new home: the California Science Center in Los Angeles. While it made its way there, Angelenos enjoyed the opportunity to witness an unforgettable sight: a spacecraft being towed along city streets. And sometime in 2013, Atlantis will become a prized attraction at the Kennedy Space Center Visitor Complex in Cape Canaveral, Florida. 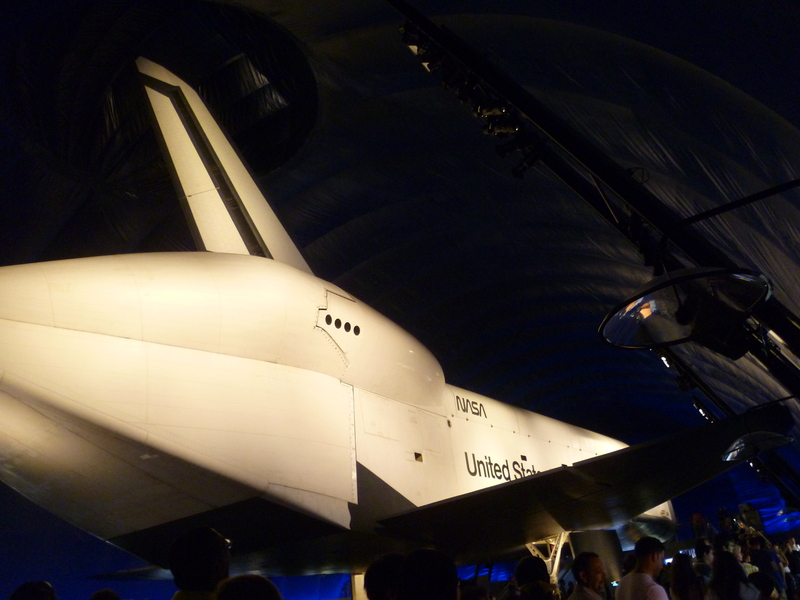 Getting up close and personal with the Enterprise was pretty special and amazing. 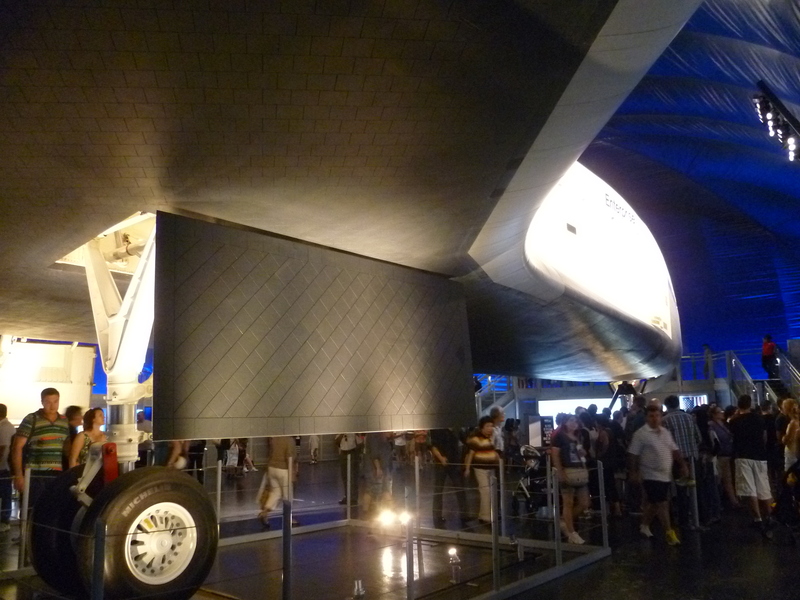 In addition to viewing the actual spacecraft, patrons of the Intrepid can peruse wall panels summarizing the history of the Space Shuttle program and how it fit in to the overall progression of space exploration efforts. There are also a few short films that play on continuous loops. Those educational materials help the visitor to appreciate the Enterprise in its proper context. But naturally, the Enterprise itself is the star of the show. In case you’re wondering, my inspection of the Enterprise was confined to the exterior; I wasn’t afforded the opportunity to peek inside. An Intrepid staff member explained that because the Enterprise didn’t carry any astronauts into space, its interior was devoid of anything that would be worth seeing anyway. Apparently, it’s little more than a giant cargo compartment. That may be true, although I would have liked to at least catch a glimpse of the instrument panel in the cockpit. With that said, just being able to walk up to such a historically significant vehicle was deeply affecting for me. My visit to the Enterprise proved unexpectedly poignant. In a surreal coincidence, just as I was arriving at the Intrepid, I learned of the death of Neil Armstrong — the man who, more than anyone else, is popularly identified with the success of the space program. It’s difficult to overstate the deservedly heroic stature earned by Armstrong and his fellow Apollo 11 crew members Buzz Aldrin and Michael Collins. That trio inspired not just a nation, but the world; and I believe they rightfully assume their place among the greatest explorers in human history — alongside hallowed names like Magellan, Cook, Hillary and Amundsen, as well as seafarers whose names are lost to history who hailed from such civilisations as the Phoenicians. The addition of the Enterprise has overshadowed what had previously been the crown jewel in the Intrepid’s aeronautics collection: a British Airways Concorde. Still the only supersonic craft that was ever deployed for scheduled service by commercial airlines, the Concorde SST occupies a prominent place in aviation history. On a more basic level, it’s just generally a cool plane with a distinctive appearance that looks modern even today, over 36 years after it carried its first paying passengers. 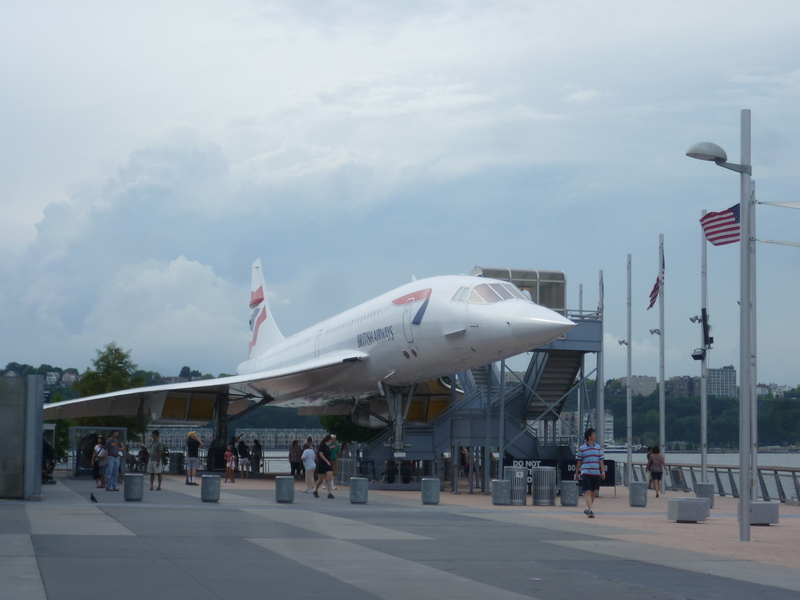 When I hit the Intrepid, the Concorde was just sitting forlornly at the end of Pier 86 (as shown here), pretty much being ignored. And access to the Concorde’s interior, which previously was open to all Intrepid visitors, has now been restricted to a limited daily number of guided tours. Making it less convenient to check out the Concorde will no doubt continue to erode the public interest in doing so. Now that a shiny new object has taken up residence on the Intrepid, the Concorde — an iconic aircraft in its own right — comes across as the forgotten stepchild. I understand that the Intrepid’s Concorde is not owned by the museum but is merely on loan from British Airways; accordingly, if the Intrepid cannot lavish upon it the attention it deserves, perhaps a more suitable home will need to be found for it. The honours, accolades, and tributes that poured in over the days after Mr. Armstrong’s death represent our generation’s farewell to him. However, to paraphrase what Edwin Stanton may or may not have said upon the death of Abraham Lincoln, Mr. Armstrong belongs to the ages now. As time crawls relentlessly forward, and mankind fans out through the solar system, the galaxy, and beyond, the astronauts at the forefront of those exploratory efforts will stand on Neil Armstrong’s shoulders. 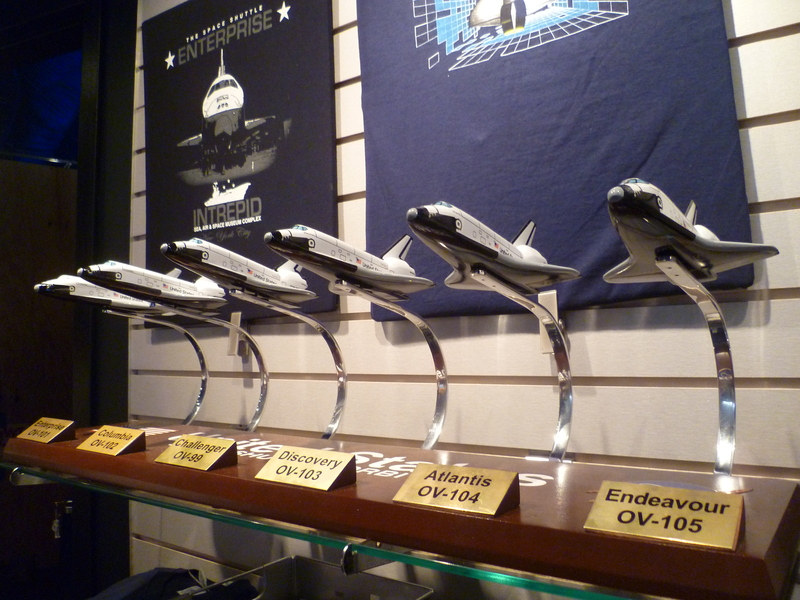 Exit through the gift shop: For $500, you can own this set of miniature replicas of all six of the Space Shuttles. I’m jealous that you’ll at least have the opportunity to watch that land-based ride of the Endeavour in October. Oh cool! I didn’t know the Enterprise was in NYC. Hopefully they open up the museum again soon! 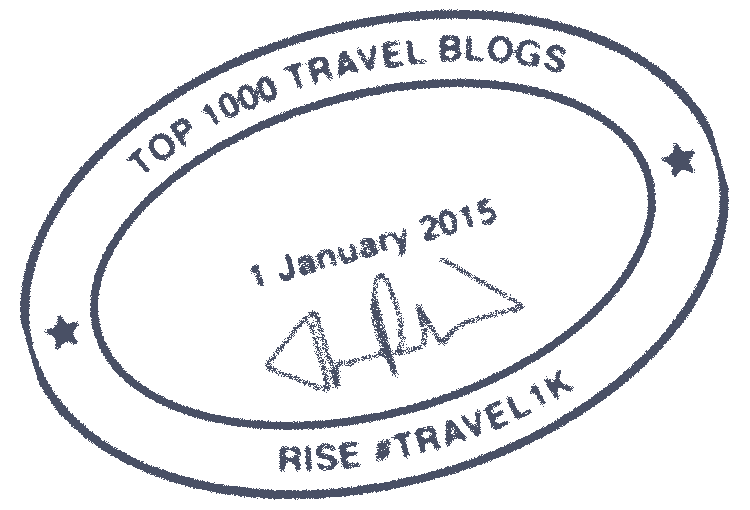 @Adam: According to the Intrepid’s website, the museum is closed for at least the rest of November. 😦 But they hope to reopen it by early December. When it does reopen, it will be well worth visiting, and not just for the Enterprise. How cool the Enterprise is just hanging out in NYC. I wonder if the museum has opened back up yet after Sandy. Space travel has always intrigued me, but I know that this stomach couldn’t handle it. @Suzy: I just checked the Intrepid’s website and the museum will reopen to the public this Friday, December 21. However, the Space Shuttle pavilion won’t be ready for reopening until the spring. 😦 (In the interim, a temporary exhibition on the Enterprise’s history will be installed, but visitors won’t be able to see the Enterprise itself.) I will update the article to reflect this.